CS-HP600 comes with titanium coated driver units to reproduce much more refined sound tone than conventional headphones. A 38mm-titanium driver creates clear and high-fidelity sound quality in both high and low frequency ranges. The flap-on attachment blocks out background noise and minimizes the exterior resonance of the sound emitted from the headphones. What’s more, the 2-level fold design adds convenience in portability and storage, making it an ideal choice for outdoor users. Superior Sound Quality CS-HP600 employs titanium coated driver units to create clear and high-fidelity sound quality in both high and low frequency ranges. The flap-on attachment blocks music in and the background noise out so you simply immerse in your favorite music. Universal Compatibility 35O impedance allows optimal sound output whether in use with portable audio devices or with Hi-Fi audio and DVD players. And, 6.3mm-long plug attachment compatible with audio and DVD players is included in the basic package to facilitate a range of different uses. Folding Design for Portability The 2-level fold design overcomes the problem of poor portability, a major weakness of conventional headphones; users can conveniently carry and use the headphones outdoors. Comments: The same or better than a pair of plantronic gamecon headphones my roommate gave to me for free after I bought these headphones. Will keep the Cresyn headphones for guitar & amp and mp3 player - smaller form factor is crucial here, whereas the gamecon is much, much bigger. Comments: The "Cresyn LMX-E630DL 3.5mm Gold-Plated Connector Canal In-Ear Sound Isolating Headphone (Black)" are far superior and a 1/3 cheaper. Comments: Good for the money as I plan to use these as backup headphones. Not worth anything over 20 dollars though. Comments: Its sound quality is pretty close to that of Audio-Technica's more expensive headphones and also better than most of name brands' with much cheaper price. I own a lot of different brands and types of headphones, so I know what is the difference between good sq and not so good sq. This CS-HP600k is on the side of good sq. This CS-HP600k is good at purely enjoying musics, movies or playing games, but is not good to be used as monitor headphones. Because its sq is enhanced on both lows and highs end. e.q. its sq is not flat. Its band design has a problem, it is too tight to a average size of head! In 30 mins, if you have glasses on, you will feel your ears start to get hurt! without glasses on, in 60 mins you will feel it too tight! 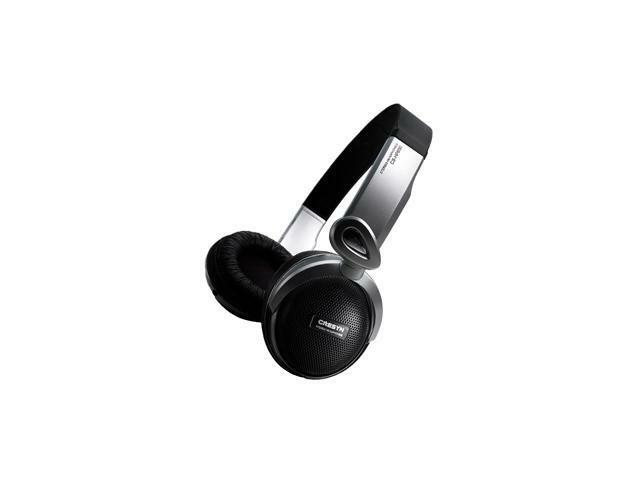 However, with its good sound quality and low on-sale price (this time $14.99) I order the second pair for back up. Even at original price $49, it's still a good deal. Cresyn dose makes good headphones and can compete with those name brands'. Highly recommend. Comments: I generally use these headphones for all type of games. These headphones sound like the Sennheiser HD212 that I used to own. Never hearing of Cresyn before and not having many reviews I was weary about buying these, but I do not regret it. I have owned Tritton AX 51, Everglide S500, and Sennheiser HD212 and also gamed with NIKI-650's I believe these headphones give a much liver environment sound than any of the mentioned. Great headphones if you are on a budget. Comments: For the price, these were a great deal. I wouldn't pay the full price for them, but anything under $40 seems reasonable. They're comfortable, fairly well built, and sound about as good as anything else in the $20-$40 price range.